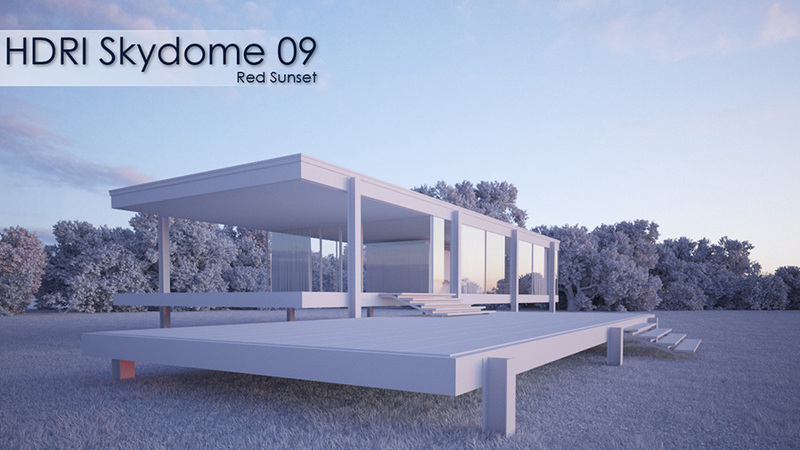 HDRI Skydome 09 is a panoramic 360° image in EXR-format to be used as spherical environment in 3d scenes. The exposure images were taken with a Canon MK5 camera at Berlin-Tempelhof in Germany. All images were manually adjusted and corrected with dust removal, alignment and chromatic abberation correction. HDRI Skydome 09 is a panoramic 360° image in EXR-format with backplates of the sky to be used as spherical environment in 3d scenes. The exposure images were taken with a Canon MK5 camera at Berlin-Tempelhof in Germany. All images were manually adjusted and corrected with dust removal, alignment and chromatic abberation correction. The set includes 8 backplates of skies taken at the same time from different angles. All backplates have a resolution of 5616 x 3744 pixel, good for even hires renders. This HDRI can really produce amazing balanced lighting with a great backplates. Wow…very complete. Sample scenes for all major packages….spherical HDR’s rectangular….and individual plates. Best single HDR I have bought bar none….will be buying more.